Gov. Sam Brownback has vetoed two bills this session: one to increase taxes and the other to expand Medicaid. Legislators return Monday to Topeka for the wrap-up session, when they must craft a tax plan. Gov. Sam Brownback kicked off the Kansas legislative session by drawing lines in the sand on taxes, spending and Medicaid expansion, and he has defended those positions with his veto pen. The question when lawmakers return Monday to Topeka is whether those vetoes will hold up. 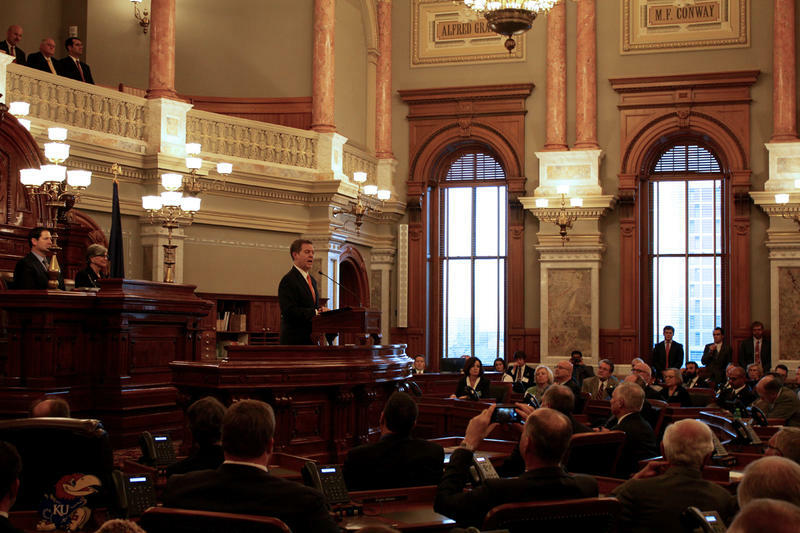 In January Brownback stood before Kansas lawmakers packed into the House chamber for the State of the State address. He took a preemptive strike against Medicaid expansion, saying the Obama-era health care law was in trouble. 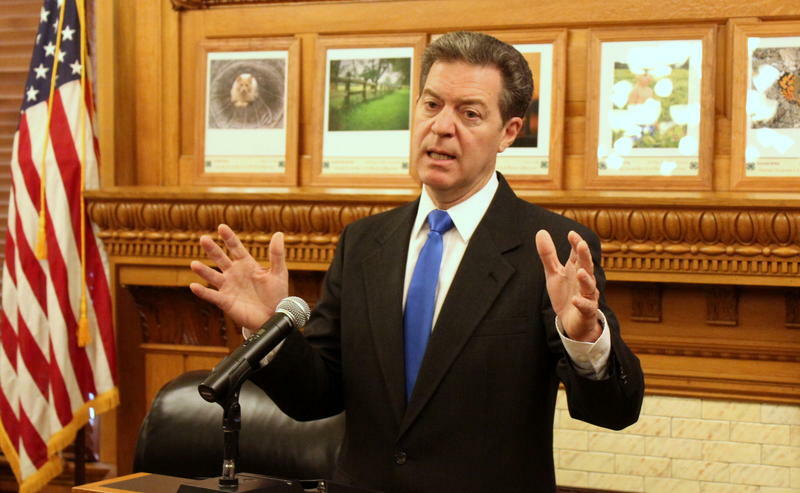 On taxes, Brownback defended his income tax exemption for businesses, saying it had grown jobs. His budget plan would keep it. “The days of ‘tax first, cut never’ have come to an end,” the governor said. Fast forward a month, and lawmakers were stepping across the line Brownback had drawn in the sand. They voted to roll back many of the 2012 tax cuts. 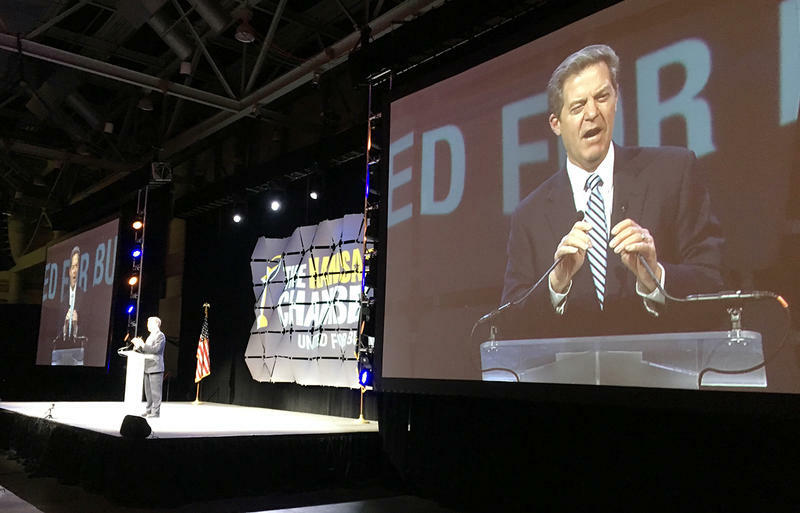 Brownback fired back during a Kansas Chamber of Commerce dinner. “I won’t sign it. I will veto this bill. This is bad policy,” Brownback said to a cheering crowd of business officials. A veto override attempt fell three votes short in the Senate. Republican Sen. Barbara Bollier said lawmakers may come back with another plan to raise revenues, this time with more supporters. “For me it looks more that we’re going to have to go to an override, which means some people are going to have to change their position,” she said. Bollier, a moderate Republican from Mission Hills, admits that in recent years it has been moderates who have given in to the will of conservatives like the governor. Will they again? The top Democrat in the Senate, Anthony Hensley of Topeka, is making a pitch to get lawmakers on board for veto overrides. On taxes, he said anything the governor will agree to won’t be enough to fix the projected budget shortfall, which amounts to almost $900 million over the next two fiscal years. “I don’t think we want him to be relevant to this process. Up until now, he really hasn’t brought much to the table in the way of tax reform,” Hensley said. But not everyone is pushing back against Brownback’s use of his veto pen. “That’s a normal part of the process. He’s elected statewide and he has that right,” said Republican Senate President Susan Wagle of Wichita. Wagle has been negotiating with the governor on a new tax plan. Republican Rep. Dan Hawkins of Wichita would like those talks to be productive. If legislators must go for a veto override, he said, maybe that means they haven’t found the best solution. Last year’s election put more legislative control in the hands of Democrats and moderate Republicans. Brandi Fisher, of the Mainstream Coalition, told a group of voters in Leawood recently that they should be calling the shots. “The one holdup that we’re having is this governor’s veto. What that tells us is that we need a new governor,” Fisher said. Among those at the Leawood meeting was physician Bill Jennings, who said he was disappointed by the governor’s veto of Medicaid expansion. To Jennings, it’s an issue of health and economics. “If patients don’t have coverage for their care, they will get care in emergencies and those who have insurance are going to pay for that,” he said. The governor has downplayed the tension surrounding his vetoes. He said the back-and-forth so far is normal on a tough issue like taxes. Brownback said recently that he might accept a repeal of the business tax exemption under certain conditions, showing he may be willing to be flexible as lawmakers work to approve a budget and end the session. Just because Kansas had an election a few months ago doesn’t mean people aren’t already thinking about 2018 legislative campaigns. Grassroots organizations in Johnson County are multiplying and starting to plot how they will elect more moderate Republicans and Democrats to the Kansas Legislature.